Since the second I first contacted Jon, my whole experience was amazing. He was very professional, always responsive, and made sure that he had every detail he needed in order to make our wedding run as smoothly as possible. When the day of the wedding arrived, Jon made sure that we were on schedule and made changes accordingly and on the fly. He always had a great attitude and it was very apparent that he's very familiar with weddings, the process and how to make sure it was absolutely perfect. Kept the dance floor going! Jon was extremely easy to work with. We had multiple calls leading up to the wedding, wedding planning sheets that helped walk through all aspects of the day and Jon confirming what we wanted, made the day go super smooth! He helped make it an incredible party!!! District DJ = 100% Outstanding! He was professional and very friendly. Easy to communicate with during the planning stages. Worked with all of our requests. Read the crowd well and played the perfect songs. Really great price for the service we received. He kept the guest dancing! Jon was easy to work with during the planning. He worked well with the other vendors. He kept the guest dancing during the reception. We had many people remark how they liked his selection of music. Jon did a spectacular job as both a DJ and AV coordinator during our wedding. He was attentive and scheduled multiple calls with us before our date to make sure we were all on the same page. What was really impressing about Jon was how he handled a last-minute (literally, minute) change of our ceremony from an outdoor site to a nearby indoor site due to inclement weather. On SUCH short notice, Jon hustled to get music playing while our guests found their new seats while getting three mics set up at the new location. He minimized the transition time and made the whole situation feel very natural. Jon was an absolute pro and we can't recommend him enough. Jon was as true professional, and phenomenal DJ. We put most of the playlists in his hands, and he knocked it out of the park. He also made a note to move onto another song if not many people were out dancing, which resulted in the dance floor always having people throw down. He was extremely timely, and incredibly organized. We are beyond satisfied with the job he did and will recommend him for any and all future weddings for friends and family. Jon was amazing!! He was so patient with me and my many questions and very responsive to all of my emails. He provided us a great cost for his service & created the best atmosphere for our wedding! At one point we had 2 dance floors going and he kept the music on pace with our reception. He provided great ideas for the flow of the day along with recommendations on music to accompany each activity. I can't say enough good things about him and how he made our day so special! Highly recommended!!! Jon Smithfield was a wonderful DJ for my wedding recently in September. I have seen Jon DJ before, and I knew the second of my engagement he would be in charge of the evening. Jon goes above and beyond to make the bride happy and content on her special day. He comes prepared for the whole day and I had zero worries. Recommendation for this DJ from District DJ, comes not only from myself, but my guests who were entertained and sent positive feedback of the majority of the night. Jon was the perfect selection for our special day. He very was responsive and flexible to the flow of our reception and kept everyone engaged with music selection within our taste. We had no issues with his service and would recommend him for any party or wedding. We actually met Jon through a great local cover band that we had heard several times. When we found out he also MC-ed and DJ-ed weddings, he invited us out to a local gig he was attending where we were able to meet and talk more. Jon has done many weddings, and he has a great personality and voice - his energy and enthusiasm were unrivaled for our wedding day. He was able to incorporate our must-play song list seamlessly into the entire night and he helped execute our timeline perfectly. Everyone was out on the dance floor all night - young and old and he was easily able to field any last minute requests - like us switching up our entrance song a few minutes before we walked in! I was so worried initially when we started our music/DJ search, because you never know who you might get assigned to with these larger companies and if you will click, but with Jon - you know you're going to get a great experience! I would recommend him 100% for your next event! Jon did an excellent job DJ-ing our wedding. He stepped in as a replacement DJ for us somewhat last minute, and we are so grateful that he did! He is extremely professional and nailed every little detail and moment that we laid out. The dance floor was packed and everyone had a blast. Thank you Jon! Jon was great to work with! From our first phone call consultation to the end of the wedding, he helped guide us to create a great experience for our guests. We asked him to use his judgement to pick music for the cocktail hour and dinner, and he nailed it with instrumental versions of popular songs. We discussed with Jon ahead of time what types of songs we'd like at the reception and what we wanted the feel of the wedding to be, and he clearly paid attention as we had guests on the dance floor all evening! He even touched base with our photographer throughout the night to make sure we were hitting the big moments as planned. I highly recommend working with Jon for your wedding! I was nervous not many of my guests would dance at my wedding but I was wrong! Jon literally had every person on the dance floor at some point during the night! I am still receiving comments from my friends and family on how great the DJ was at my wedding! I had a great experience working with Jon and he was so professional and on top of everything that I had no worries during my wedding day! Would highly recommend District DJ!! DJ Jon was absolutely fantastic! From planning to execution, our wedding music went off without a hitch. Jon was such a fun person to work with and honored each of our requests from ceremony A/V, cocktail hour and dinner music, to keeping the party going all through reception. Jon had never played at our venue and went the extra mile to meet us weeks in advance on location to scout all logistics. His equipment and coordination were flawless, and we highly recommend choosing Jon for your next event -- you will NOT be disappointed! Jonathon is one of the reasons why my wedding day was absolutely perfect! He worked hand-in-hand with me to ensure that I had absolutely everything I wanted from the ceremony to the reception, and all that was in between. He knows so much about weddings, and really gave me some great advice on what works and what doesn't, even beyond the music. Plus my guests loved him, and he definitely knows how to get people on the dance floor. If you're looking for a DJ who is easy to work with, great with guests, and genuinely wants your day to be awesome, I highly recommend Jon! Did an amazing job. Dj’d my sisters wedding. He was very personable and great in the microphone. Would recommend to anyone and would definitely request him for the future. Jon Smithfield provided his services for our ceremony, cocktail hour, and reception. As soon as we met Jon, we knew he would be a great fit. He's flexible and willing to accommodate, but you'll want to take his advice because he knows his stuff. Jon came through for us in a huge way when our tentless backyard wedding was hit by an unexpected thunderstorm halfway through the reception. Jon moved all of his equipment inside the house and continued the dance party with his improvised living room set up. Needless to say, Jon saved the night and the guests went on dancing and partying to their hearts' content. He's also got a great voice to be a DJ. We were really happy with Jon and gladly recommend him to anyone. Smitty (Jon) is an incredible DJ/MC. He made the entire wedding, from the ceremony to the end of the reception, flow seamlessly. He was also the EASIEST and MOST PLEASANT vendor we worked with for our wedding. We had our wedding in a heavily trafficked downtown area, in a difficult venue, along with a ceremony in a public park with little power access. And despite all the difficulties, Smitty ran our wedding in what seemed like effortless professionalism. Smitty kept everyone on the dance floor the whole night, nailed the song timing on the dances, and made our ceremony the formal and classy affair we wanted it to be. He made our wedding the spectacular event we were hoping it would be, and without him, I do not believe we would be saying the same thing. We used Jon Smithfield with District DJ as the DJ for our wedding on 5/6/17 at the Gettysburg Hotel. Jon did an amazing job that far surpassed our expectations, and we are so happy that we chose him. The process was extremely easy with the worksheets that you fill out prior to the event. 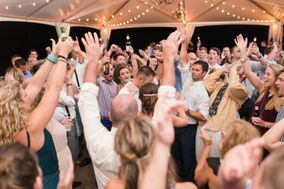 On the day of the wedding, Jon did an excellent job of creating an atmosphere that energized our guests and got them on the dance floor, which isn’t an easy task with a group that spans several generations. He listened to all of our requests and preferences, and from there seamlessly selected music that kept the party going all night. If you’re looking for an experienced DJ for your wedding that does more than just hit play on a playlist—that actually engages with your guests and ensures everyone is having a great time, all while being true to what the bride and groom want —I highly recommend District DJ! Absolutely loved this DJ! The whole night went flawlessly and everyone from the kids to the grandparents were loving the music. Would definitely recommend! Jonathan was amazing and so wonderful to work with! He provided an excellent music selection, was communicative, flexible and just overall a joy to be around. Will definitely use him for future events! Jon was incredible!! Everyone was dancing and having a blast! We left the music selections up to him and the guests which turned out perfect! He was a pleasure to work with and very professional and responsive!